The video above was taken with my iPhone 5s. Rehearsal at our place, January 31, 2014. 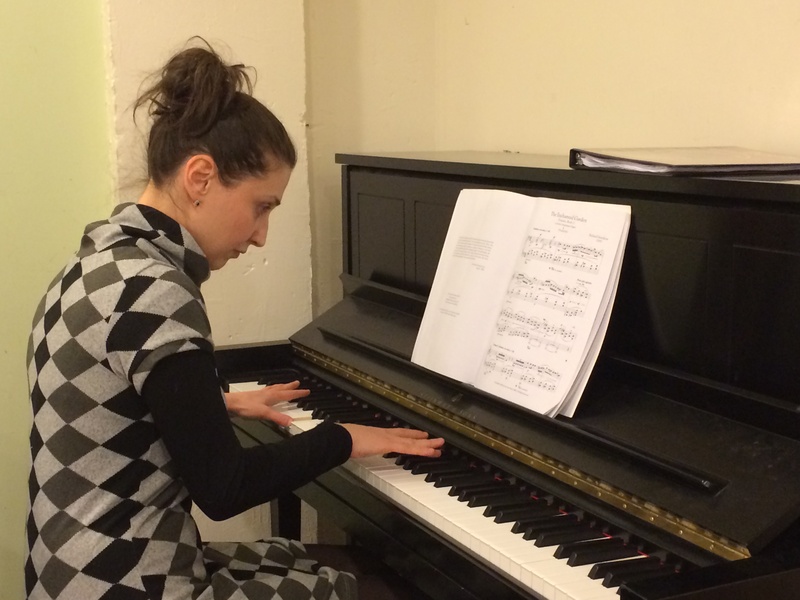 Pianist Inga Kashakashvili trying out the piano in the Green Room, Merkin Hall. The important issue is not the definitional boundaries of the term, but rather “what is the future of the genre”. Here is a depressing view of that future: I learned about Vanhoenacker’s article from a posted to Facebook. halfway between a chamber music concert and a house party. It’s equal parts musical and social. It’s a way to enjoy yourself and enrich yourself. Sam and I often speak about how one of our goals is to “change the social role of classical music.” By this we refer to changing the perception of classical as outmoded, boring, elitist, expensive, etc. But we also refer to reforming it’s socioeconomic role. The music performed at groupmuses is small scale: small spaces, few listeners, fewer performers. Where else in the music industry but Groupmuse are such performances economically feasible? The pop and dance music industries are dominated by huge stadium tours and festivals. Few small venues can afford to operate and few acts can afford to tour them—and most of these venues and tours are hardly profitable. The classical music industry is increasingly dependent on donations and endowments, so small organizations putting on Groupmuse-size concerts have difficulty staying in business. It’s naturally difficult to profit off a small concert—fewer audience members mean fewer ticket sales, after all. Then there are venue and marketing costs to consider. At the end of the day, it’s rare for the musicians and the venue operator to walk away with a wad of cash worth the time they spent on the concert. A groupmuse, when you look at it through the eyes of a heartless, cold-blooded money-shark, is the same small concert, minus the costs of marketing, maintaining a venue, and paying the venue operator. More $$ for the performers means more viable small concerts. And that’s reforming the socioeconomic role of classical music. Now that is something to think about. Let’s do think. And then let’s act — if not with this model, another.